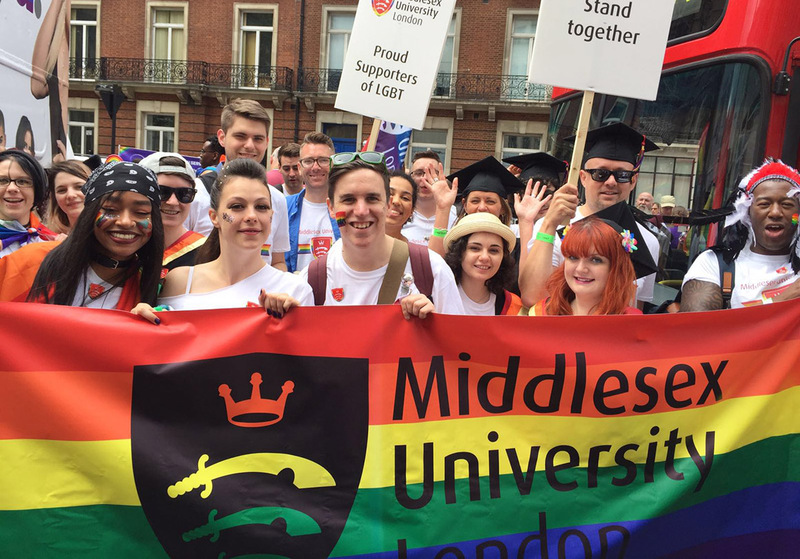 A group of 50 Middlesex staff and students marched through the heart of London on Saturday 25 June, with over 300 other organisations, to raise awareness of LGBT+ (lesbian, gay, bisexual, trans) issues and campaign for equality. The group was made up of students, staff allies, and supporters including representatives from the London Chamber of Commerce, Purple Camera Media and Hertfordshire CC. Enjoying shouts of support from the 750,000 crowd, including Middlesex alumni, the group used the festival as a platform to celebrate and embrace individuality and diversity as well as to share general high-spirits. “The whole Pride weekend was an overwhelming demonstration of love shown to the LGBT community, remembering the recent events in Orlando,” said David Williams, Director for Corporate Engagement. “A reminder that we are one human race whether we are in or out of the European Union – people coming together for the greater good; acceptance without exception. Run entirely by volunteers, Pride in London is the biggest one-day event held in the city and is one of the largest LGBT celebrations in the world, attracting millions of visitors each year. The Festival showcases some of the most inspiring talents and celebrates diversity in the LGBT+ community. It includes theatre, dance, talks and conferences, LGBT+ tours, art and much more. The Student LGBT assembly are planning a range of events over the year to support, promote and celebrate making each individual the best they can be. This autumn, Middlesex will be entering the Stonewall Workplace Equality Index, which assesses achievements and progress on LGBT equality in the workplace.